Christmas Trees: An Eternal Symbol of Christmas? Decorating a tree with spangly baubles is a tradition that dates back to the very birth of Christ himself. As any biblical scholar will confirm, Jesus was born in a pine tree that was heavily bedazzled for the occasion. Oh, wait. That’s not quite how it went, is it? In fact, the practice of decorating with pine boughs and trees is a custom that predates Christianity. For example, the Romans enjoyed Saturnalia, a festival that went over several days. It included gift-giving, generosity to the poor, a wee bit of ritual sacrifice and, you guessed it, decorated trees! The Vikings were also fond of decorated boughs. During their mid-winter festivities, the evergreen trees were seen as a potent symbol of life continuing despite the hardships of winter. That’s just a tiny snippet of the history of decorative trees, but you can see they’ve never been a strictly Christian affair. In fact, decorated trees weren’t really adopted by the Christians until around the 16th century. It was the German Christians who adopted the tradition, but it didn’t really take off for a while. By the 19th century, Christmas trees existed in the US, but Americans thought they were a strange custom. No one else was terribly keen on them until a British Queen with a German husband got a one. Once a family portrait of Queen Victoria and her husband, Prince Albert, with their tree hit the papers, the Christmas Tree became the in-thing. What has people outraged about the humble Christmas Tree right now? At the moment, it’s the removal of the word “Christmas” from the boxes of the plastic trees sold at Big W.
People think that Christians invented the decorated tree. If they aren’t labelled, how will we know what to do with the darn things? Instead, they are being billed as “Fibre Optic Tree” or “Pine Tree” and other unthinkably offensive titles. We don’t celebrate PINE. But maybe we should?! People are baffled, upset and feeling as if the age of political correctness is stealing their religious celebrations. It doesn’t matter that the tree itself has decidedly un-Christian roots (see what I did there?!) because it is an affront to (some) Christians. Some claim that non-Christians don’t even BUY trees, so what’s the point of taking Christ out of it?? I mean, I’m an atheist, raised in a non-religious home, who has had a tree every December for my whole life, but whatever. Is this really about erasing Christianity from the holiday? Reeeaalllyy???? No, it isn’t. It’s actually something far more sinister than that. You see, Big W is still selling Christmas decorations to adorn their generic, celebratory, plastic pine trees. Oh, Megan. By next year, they’ll all be on board! Soon, generic celebration trees will be available year-round. The quality will probably decrease, meaning fewer uses per tree. But you will need more uses for what these big retailers have in mind! For each festive occasion, we will see an onslaught of themed baubles and decorations. Catalogues full of styled, generic celebration trees for every occasion. This isn’t about erasing religion; it’s about a new revenue stream for department stores and dollar shops around the world! Mark my words, come February, you’ll be considering a Valentine’s Day tree. Forking out your hard earned cash for heart baubles and sparkly cupids. St Patrick’s Day trees will be festooned with pots of gold and leprechauns. How do you think your kids will decorate the Mother’s Day and father’s Day trees next year? And will there be a competition in your neighbourhood for the spookiest Halloween tree? Artist’s impression of the future of the generic tree. It won’t end there. Once the first kid from school has a party complete with a personalised birthday tree, the trend will become so widespread that, in a century or two, we won’t remember a festive occasion without a decorated plastic tree. Insatiable retailers are branching out! They’re pining for greater profits! Big stores want evergreen profits! They don’t even care where their greed leaves us! 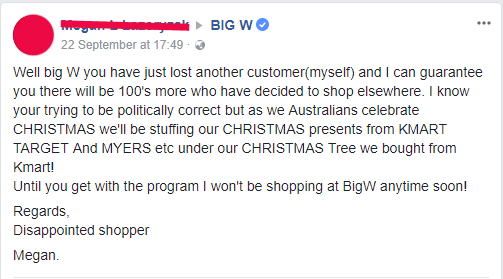 Repeat after me: Big w is not stealing Christmas. Do you think decorating a tree for every occasion is ludicrous? A bizarre and unlikely conspiracy? Maybe it is. But it seems far more plausible than a department store that sells loads of Christmas products attempting to erase a religion by omitting the word “Christmas” from the packaging of one of their products. The idea that they are appeasing some minority group who isn’t even campaigning to remove the word “Christmas” from anything makes no sense. Seriously, no one, not even Big W, is stealing Christmas. The right to practice your religion is literally enshrined in Australian law. If the box doesn’t explicitly say “Christmas Tree” on it, I am sure we will still figure out how to wrap it in tinsel and sling ornaments onto the bendy plastic branches. ← Is the “Yes” campaign creating “No” voters?